Path lighting is for walkways, sidewalks, and paths. Safety, security, and comfort with an upscale nature. When stepping off into the unknown because you can’t see a huge risk is taken. A few well placed path lights can light up a walkway at a very low cost with LED integrated lighting. Guests will appreciate the thought put into their safety and the style will elevate the look of your home. Walkways are hazardous with steps and cracks low voltage lighting will be easy on the bills while increasing the amount of hours you can use your property. It is a well known fact that thieves prefer a dark space over a well lit home, outdoor lighting makes a home undesirable to criminals. Below you will find our information to get started on an estimate for path lighting at your home. 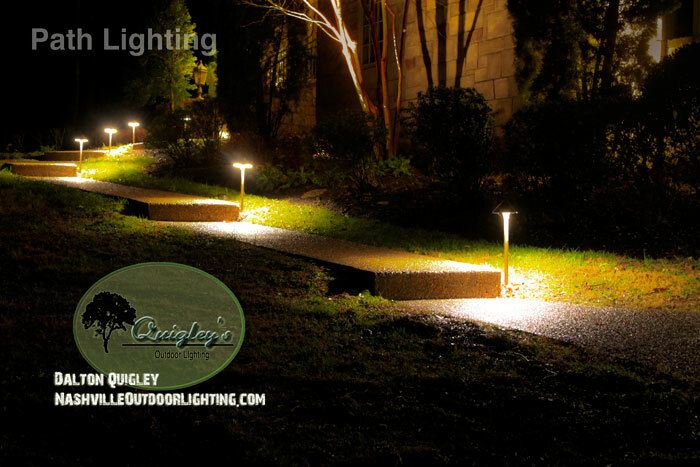 Path lighting installation on walkways or your patio in our service areas of Nashville, Brenwood, Franklin, Spring Hill, and Nolensville TN.